I was originally going to talk about something else here, illness but all of a sudden I like felt the holy ghost or something and was inspired to talk about this. Seriously everyone, contagion this is an important issue that I feel strongly about. I’ve actually had serious conversations about this. Busta Rhymes – Packin Them Things (prod Kev Brown). This is just sort of a given. And even Busta Rhymes voted for Obama. You know where to find Busta, so go check out myspace.com/kevbrown. Blu and Mainframe – Hold On John. Off of the Johnson and Jonson record, which you’ve been hearing bits of for the last couple years or so. Apparently the joint is actually out now, and it’s highly recommended. I don’t think there’s a single cut on this record that I don’t like. I’ve said enough about this record before, so I’ll leave it at that. Shouts to Steve for this one. myspace.com/jandjbabyproducts. I mean, think about it. The only dude who seemed to be able to dance. He could beatbox. He wore rappidy-rap style clothing – well, comparatively. 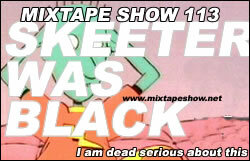 Oddly enough, I never felt like this was stereotyping – I just naturally internalized that Skeeter was Black. I seriously can’t wrap my head around the fact that some people don’t get it. To my white friends – I like you all a lot, but sometimes you miss things. Very important things. Like which cartoon characters are which race. Stanza – Do. As heard previously on your favorite rap podcast, this is another selection off of Name This Album. The lyricism is sort of bizarrely great (trying to imagine the hand contortions in the beginning is alternately funny and amazing) and as with the rest of the cuts on here, there’s actually a message in here. And as I mentioned in the outro, Stanza has inexplicably put this entire record up online for free download – inexplicably because it’s easily worth the money. The record is dope. Go get it here, and check out the rest of the site at mqrt.com. MF Doom – Rapp Snitch Knishes feat Mr Fantastic. Does anyone actually know anything about Mr Fantastic? I mean, I could google the dude, I guess, but after listening to this, I’m realizing that I haven’t heard much of anything from the dude.myspace.com/mfdoom. This of course, is all based on when the show was on Nickelodeon. I quit watching when Disney took over. Actually I think at that point in my life I was a little busy to be watching cartoons (okay, it was just on at an inconvenient time. I definitely used run late for school because I wanted to catch the end of Pokemon). Q-Tip – Gettin’ Up. On the Dilla rework – you might have heard this one, but for those who haven’t – dope. This really is a proper rework. myspace.com/qtip. Marlena Shaw – California Soul (Diplo remix). For real, when I read the track title before actually listening to it, I was both excited and worried to hear what sort of destruction Diplo would wreak on this classic – but it’s oddly restrained. It’s good. myspace.com/officialmarlenashaw. Outro: Qwel and Kip Killagain – Heliocentric (Instrumental). I actually like Qwel. So, really. Doug was clearly white, Skeeter was obviously Black. The logic doesn’t really run across color lines, however – I mean, what about Bee Bee? She’s blue too, but I never got “Black vibes” from her, if that’s an appropriate word. And reversewise, come to think of it, Patti was sort of ambiguous – mixed ancestry, perhaps? She was sort of dark. Connie was Asian. I’m fairly confident about that one. Am I overthinking this? Any other theories are welcome. Oh yeah, and thoughts on the music. You know.